Im thinking of getting some more gundrills. I am sure my method of using them is not the best, I actually start the bore with a center drill, then hold the gundrill in my hand to feed. This is on the wood lathe. exactly how I do most long drilling. I remember seeing a picture somwhere of someone holding the drill in the toolrest of the metal lathe. I would like to see a picture or get an explanation of a better way to use these. for air I made an adapter out of vinyl hose to slip over the end of the drill. Thanks in advance! Eaxactly what do the only difference being is that I am using a metalworking lathe that literally weighs a ton. Speed used when boring is around 1150 rpm for nicely centered pieces or 850 rpm for off-centered pieces e.g. barrel drone sections and feed speed will vary with the type of wood and how well it is cutting. The main advantage of holding the dril in the hand is that if you feel the drill running off you can to a certain extent compensate. You can also make up a holder to improve grip. 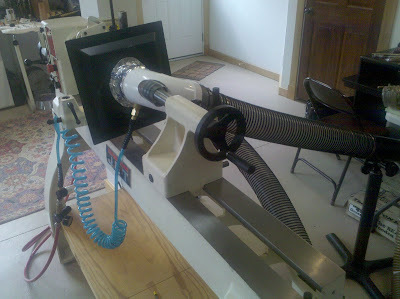 Here is a pic of my old gundrilling arrangement on the Myford Super7. The holder was a cast iron gizmo I made which indexes against the cross slide and carriage for ease in setting up at center. It allowed the holder to be run back and out of the way of the tailstock for initial center/twist drilling and then the holder was quickly returned to center with the use of a stop (not in view in the picture) against the rear of the carriage. It worked very well, however a much simpler holder might be made which could screw to the top post. The stock steady rest was bored out at true center to accept bearings of various i.d. 's, thus making it possible to taper the end of a rough square, load the bearing on the taper, and drop into the steady and drive with a 4 jaw chuck, (or rounds in the 3 jaw chuck.) The steady bearings worked well also, and it was well worth the effort of boring the steady, a modification involving clamping the steady to the ways as well as a vertical milling fixture, then loosening it from the ways and feeding it into a fly cutter held in the headstock. The amount of material removed from the steady casting was minimal and it did not affect the use of the bronze steady shoes in the normal manner. A slip of cigarette paper was placed between the mating surfaces of the steady while the fly cutter was introduced, which, when removed, provided a nice snug fit for the bearings. For the air feed, I used a compressor by drilling out and tapping the rear of the gundrill and installing quick change male air fittings on each drill. This is an easy modification to the gun drill and is accomplished by putting the shaft of the gundrill in the headstock spindle and drilling/taper reaming with the tailstock and then tapping with the proper taper tap. Great ideas, thank you! I feel a little better about my setup, but im always looking to streamline it. I hand feed almost all of my gun drills as well, and make continuous small adjustments to approach of the bit as I bore, as Chris describes - I can feel when the drill is running true. This does seem to improve centering of the smaller, more flexible sizes. However, the real reason I do this is because it's the only way I can do it, since my lathe is not a long-bed and the spindle isn't large enough to accommodate a chanter blank. It certainly works fine, and I think it's actually advantageous for thin drills which are very prone to buckling and/or sagging if fed from the end without guidance near the insertion point. For larger diameters - say, over about 6mm, I think there may be advantages to tailstock mounting of the gun drills as described by Mark H. and others. I couldn't really make out the dust collection system in the photos, Dirk, but it sounds like a good idea. Gun drilling is one of the dustiest activities in the workshop, at least in terms of making the dust airborne. If you're doing feeding quite slowly (as I think is best) then the dust from the gun drill is very fine. I notice what appears to be a filter drier on the air hose. Does this get clogged with oil ( depending on compressor type), stifle airflow, remove much moisture, last long, and are they expensive? I used the fine feed tumbler on the Super 7, and although I don't have the lathe anymore, I remember thinking that this was plenty slow enough, and it allowed me to monitor the shaft of the gundrill with my fingertips while the carriage did the work. My feeling at the time was that the lead screw was better at feeding the drill than my shoulder. The important thing in this operation is to begin the hole very accurately, utilizing both the center drill and a sharp twist drill in the tail stock. If the hole is started really truly, the gundrill will naturally wish to follow the path of least resistance, i.e. the dead center of the rotation. If all is not right, the shaft of the gundrill will vibrate, and a bit of "feeling" of the shaft will quickly find the center of the stock. after that, it will want to run true if all else is in-line to begin with. 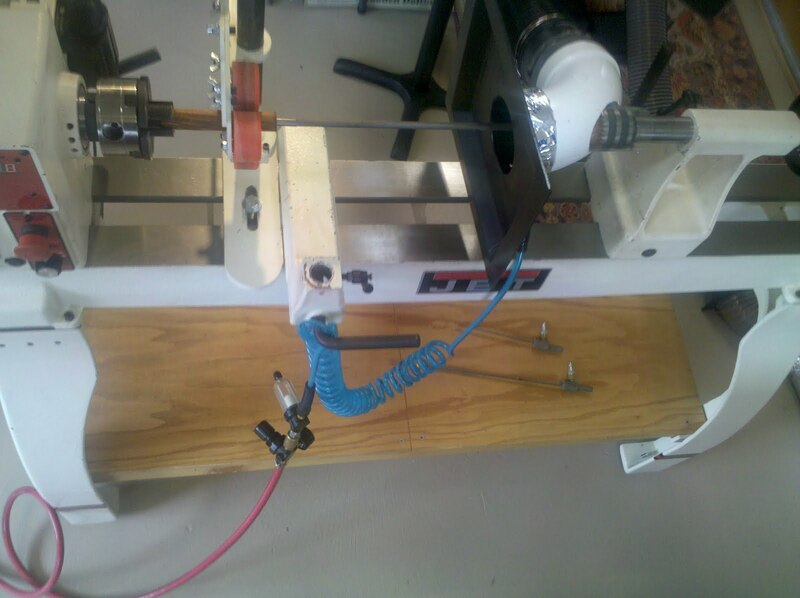 At the finest feed rate on that particular lathe, the "chips" come back like black baby powder. I usually collected the dust with a modified shop vac nozzle attached to the steady rest. Nonetheless, it usually seemed pointless as the invisible plumes of dark talc would fill my nose in short order. In-line moisture traps are very inexpensive, and although there was one supplied with my compressor, they are not really needed for this application. That filter drier is just cheap insurance against the possibility of spraying water at some nice, dry piece of wood. nothing more. It probably isn't necessary, but the thing came with some other air tools I bought. It also doesn't clog or appreciably reduce the pressure. Then again, I'm using a fairly hefty 30-gallon compressor, and the max pressure at 140 psi is much greater than what I need for this work. I think about 100psi works just fine. My compressor is the oil-lubricated type, and is not too loud. I have one 20 or so inch 5/32 in drill that have been using successfully, if im not careful, it still wanders. I assume it was designed for boring metal, but seems to work fine again if Im not in a hurry. I remember reading that you can find gundrills specifically for wood, but many surplus drills can be had cheap, but I assume they are designed for metal also. Is this a problem? What is everyone else using? Gun drills for cutting wood benefit from having a different cutting geometry on them than the one used for metals. The point position of the tip is changed from being a quarter of the drill tip diameter(d), to d/3.5. There is also no need for the outer secondary cutting facet.